Grab your ruby slippers and click your heels together, as Circus Smirkus goes Somewhere Over the Rainbow with a new spin on the Wizard of Oz. 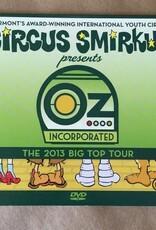 Enjoy the 2013 Big Top Tour, captured live! Running time is 97 minutes. Pull back the curtain and discover fun for the whole family!